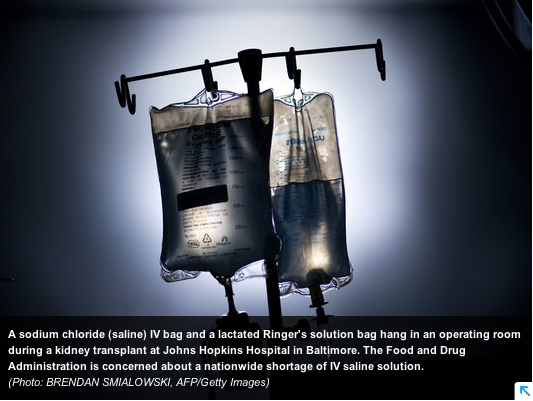 This shortage of standard bags of saline puts many patients at serious risk of death from sodium chloride overdose. Due to the fact that clinical pharmacy works in the background at any medical facility, many physicians, nursing staff, and the general public are not aware that pharmacy technicians routinely compound virtually ALL IV medications in our nation’s medical facilities. Unfortunately, in many states there is little, to no regulation or oversight of pharmacy technician’s core competency (see the emilyjerryfoundation.org home page to look up the Pharmacy Technician Scorecard for your state). My concern lies in the fact that if a facility runs out of standard bags of saline with .9% sodium chloride, then the pharmacy will be forced to compound this base solution with 23.4% hypertonic saline and add a diluent. If one mistake in calculation is made it could subsequently prove lethal to many pediatric patients. In 2006, as many of you are already aware, I lost my beautiful 2 year old little girl, Emily Jerry, to a very similar tragic medication error, when the clinical pharmacy, at a leading pediatric hospital here in Cleveland, ran out of standard bags of saline with .9% sodium chloride. In my daughter’s case, the pharmacy technician filled an empty compounding bag with 3 vials of 23.4% hypertonic saline. The Emily Jerry Foundation is recommending that, if the facility where you, or your loved one, is being treated runs out of standard bags of saline, you should insist that only a pharmacist prepare ALL IV medications during the course of your stay. We have gone ahead and prepared the following form letter that you can use to help during this shortage, prior to being treated or admitted to a medical facility. If you decide to use this letter, please make sure to fill in the appropriate fields with the correct information and get it signed from a hospital administrator in charge. Please don’t be afraid to INSIST on it! The Emily Jerry Foundation will be honored at the upcoming Intelligent Hospital Pavilion held within the Health Information Systems Society (HIMSS) Annual meeting in Orlando, Florida February 23 through 27. I am excited to be giving the keynote speech at this conference at 8:00am on February 23rd to kick off the event, while the awards ceremony will be held on February 24th (which is Emily’s birthday). Each year, the Intelligent Hospital brings together cutting edge technology companies to create a temporary hospital environment to help raise the level of awareness and to educate the healthcare industry on the many applications these technologies serve. Visitors to the pavilion see first-hand how these technologies are able to deliver real time data from the patient’s bedside to the clinicians smart mobile devices, thus providing care givers with real time visibility of people, assets, and processes. When properly implemented, these systems can have a tremendous impact on patient safety and on the quality of care delivered, while at the same time, reducing overall operating expenses. “The EJF and Intelligent Hospital share similar missions in that we both aim to save lives every day and improve the health care delivery system in America and around the world. To do this we must acknowledge the fallibility of humans, despite the best intentions. Given enough chances, anyone can make a mistake that will harm someone; it’s not a question of if, but when. Let’s get beyond the blame game, learn from our preventable mistakes, and design and implement robust systems to prevent them from happening ever again.” Chris Jerry, CEO & President of the Emily Jerry Foundation. The Emily Jerry Foundation’s Pediatric Safe Label Program Moving Forward in 2014! Tomorrow, I am frankly looking forward to leaving the ice-covered landscape of Cleveland, Ohio for sunny, Laguna Niguel, California, for the Patient Safety Science & Technology Summit. As I have mentioned previously, I am truly honored to be attending and presenting at this very important meeting that is bringing together leaders from around the nation, from government, the medical community, technology manufacturers, etc., that are all joining together to find formidable ways we can all work together to eliminate deaths from preventable medical errors in the United States by 2020. As I have mentioned previously, in a recent study, by the Journal of Patient Safety (September 2013 – Volume 9 – Issue 3 – p 122–128) titled “A New, Evidence-based Estimate of Patient Harms Associated with Hospital Care”, puts the number of deaths from preventable medical errors in our nation at over 440,000 lives per year. Again, this makes fatalities in the United States associated with preventable medical errors, the third leading cause of death, aside from cancer and heart disease! This is completely unacceptable, in my opinion, to say the least! This crucial “meeting of the minds” is not only about coming up with solutions to this deadly problem, it’s truly about coming up with actionable “commitments” from everyone involved and, subsequently, holding one another accountable for these “commitments” that are made, so that we can all track the progress on a year after year basis. This is what sets this particular annual meeting apart from many others I’ve attended and participated in over the past several years. The important commitment that has been made by The Emily Jerry Foundation revolves around our GUARDIAN ANGEL Pediatric Safe Label Program , that was first introduced in 2013. Due to the fact that adverse drug events and medication errors are of particular concern with babies and children, coupled with the fact, that with pediatric medications, body weight is an extremely critical issue with respect to calculating the correct dosages, The Emily Jerry Foundation has committed to getting the Guardian Angel logo printed on ALL medication packaging intended for babies and children in our nation’s hospitals. I am very pleased to announce that the Patient Safety Movement Foundation will be highlighting this very important commitment at their upcoming Summit, along with the commitments from Massachusetts General Hospital and Brigham & Women’s Hospital. Along these lines, the timing couldn’t be more perfect! Earlier this week, I received official confirmation from another one of The Emily Jerry Foundation’s key technology partners, Codonics, that they have allocated engineering resources to the integration of the GUARDIAN ANGEL logo into their SLS system (in the beginning of 2014), so that every medication label produced by their SLS system, for medications intended for babies and children, will now have our GUARDIAN ANGEL logo printed on it!